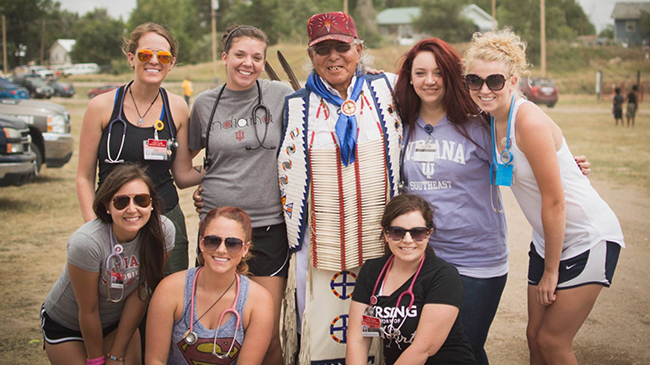 IU Southeast nursing students (back row, from left) Audrey Stillwell, Kaitlyn Hunt, Britin Abbott, Morgan Mahoney, (front row, from left) Kristan Markland, Danielle Ramser and Melissa Vance are joined by Seymour Young Dog at the Pine Ridge Reservation in South Dakota. Photo by Dr. Julia Mattingly. (NEW ALBANY, Ind. )—“The singing, drums and dancing mixed with the smell of sage to create an energy that I never want to forget,” wrote Audrey Stillwell, a senior nursing student from Madison, Ind., in a blog post after taking part in a Lakota Sioux pow-wow on the Pine Ridge Reservation in South Dakota. The course is a unique example of IU Southeast’s commitment to service learning and community engagement—an academic immersion that takes students deep into another culture, with benefits for both. “I fell in love almost instantly,” she said. Over the years, Mattingly has established relationships with Lakota Sioux friends and colleagues on the reservation. This history, and the trust she has earned, enables her to provide a deeper level of access to the community for her students. That access is vital in order to engage individuals whose lives are so different from those of the students. Though accurate statistics are hard to come by, Pine Ridge is generally considered the poorest place in America. According to the nonprofit group, True Sioux Hope Foundation, some 97% percent of the inhabitants live below the poverty line, with unemployment at around 90%. Nearly two-thirds of the homes are substandard, and nearly one-third are without electricity or running water. Over half are plagued by toxic black mold. Overcrowding is the norm, with an average of 17 people per two-room dwelling, and many residents living in shacks, trailers and cars. Poverty feeds an enormous range of health problems, individually and community-wide. The life expectancy on the reservation is 47 years for men, 52 for women. Nearly 80% of the households are impacted by alcoholism, and diabetes is rampant, affecting over half the population over 40–a staggering 800 times the national average. Infant mortality is the highest in North America, and adolescent suicide is also above the norm. “It’s not for everybody,” she said. For Abbott, a self-confessed “military brat” with wanderlust and a commitment to mental and psychiatric health, the trip promised more than the usual clinical experience. “There is something special about being able to go into a community and talk and connect with your patient, their family and their environment,” she said. At Pine Ridge, the students learned an important lesson: to practice community health, you have to understand the community. Healthcare is a relationship built on trust. So the trip was also a time for horseback riding on the plains, for attending a pow-wow, for learning how to bead, and for visiting Wounded Knee, site of the massacre of Sioux ancestors by U.S. soldiers in 1890 and a touchstone for Native American consciousness. Winning the trust of this community meant internalizing the complex and tragic history of the relationship between two peoples. It meant shedding the devotion to a schedule that creates a comfortable sense of control, and going with the flow by putting themselves on “Indian time.” It meant opening up to the human hearts and minds behind stories of depression, anger, hopelessness and addiction. It meant confronting and reflecting on poverty and its effects, with eyes wide open. And it meant finding ways to practice nursing, responsibly and efficiently, amid so much ambient hardship. It was not always easy. The students’ blog posts hint at difficult days and uncomfortable situations, without elaborating. Yet they seemed to gain resilience from the warmth and openness of their hosts. More than one of them wondered whether they were the ones being healed by the Lakota Sioux. “While Pine Ridge is a place that often is seen for only its negatives, I am always struck by the resilience, sense of community and family, and beautiful culture,” Mattingly said. 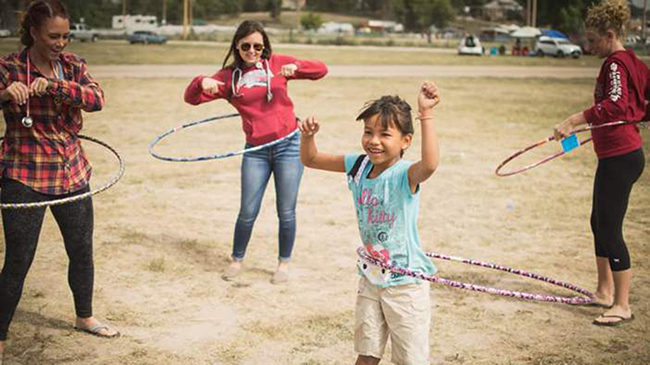 A Lakota Sioux girl gets the hang of the hula hoop with (from left) Danielle Ramser, Kristan Markland and Morgan Mahoney. Photo by Melissa Vance. “It’s one thing to hear of the barriers this population faces in receiving health care, but it is another thing to see it first hand,” Stillwell said. For Mattingly, these sorts of reflections capture the essence of nursing in this challenging context. During their time on the reservation, the students bonded not only with the locals, but with one another, as the challenges of the surroundings and the magic of shared insights forged a unique sense of belonging. “Pine Ridge has a way of taking hold of your heart and filling it completely,” Abbott wrote. Homepage photo: Britin Abbott checks the blood pressure of a Lakota Sioux girl. Photo by Melissa Vance.